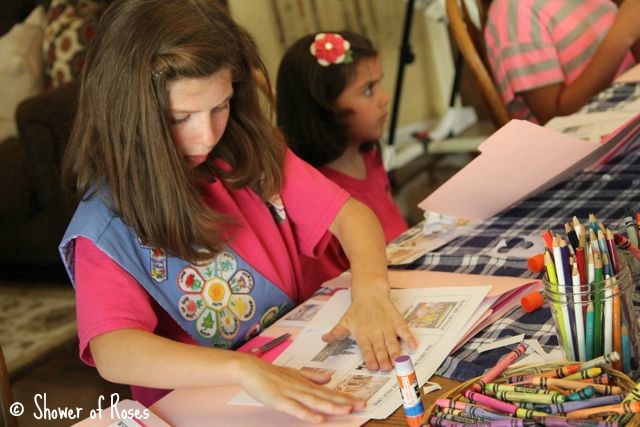 A couple weeks ago we had our 7th Little Flowers Girls' Club meeting for Wreath IV, which completed all four wreaths of the Little Flowers program. It has been a busy four years and the girls have grown so much, both physically and spiritually! 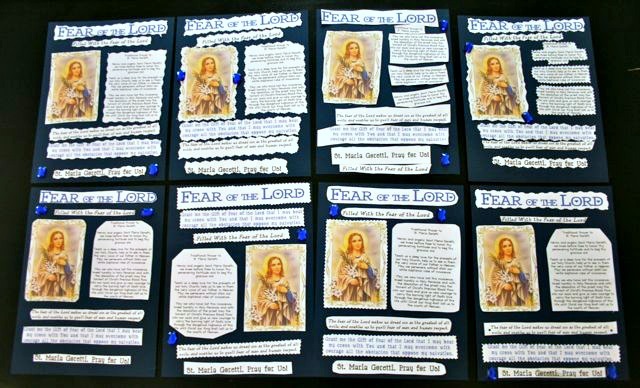 Anyhow, about this last meeting, which focused on the Gift of Fear of the Lord and St. Maria Goretti... Well, for the first time, I was not prepared! I put off getting ready until late the night before, when I started putting together my notebook page. I baked cupcakes in the morning, but the baby was so fussy I wasn't able to get much else done. 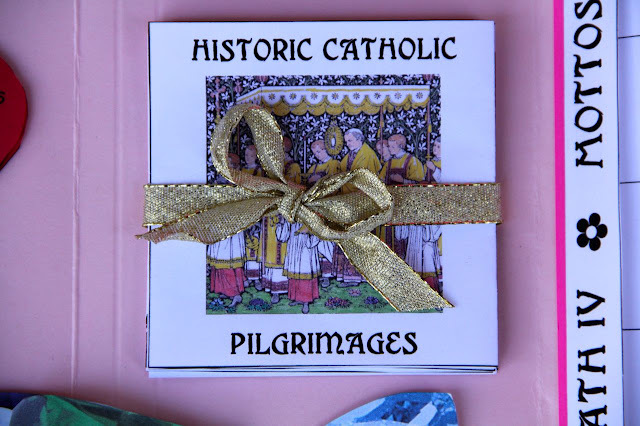 Thankfully I was able to print coloring pages and the craft printouts while holding him, and the lap book supplies were waiting in a file from the beginning of the year when I printed them all out. Twenty minutes before the meeting I still needed to put together a sample notebook page, and decorate the cupcakes! Aahhh!! It didn't happen. 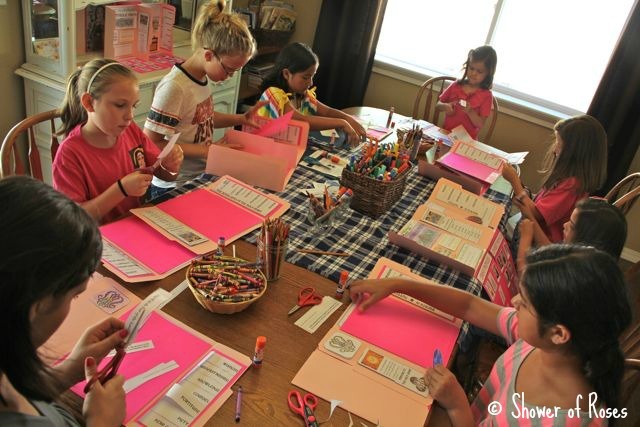 I figured, after 4 years of making notebook pages, the girls really didn't need a sample page - they know what to do, so I started on the cupcakes... More on that below! Rose wanted to know where her Sash and Lap Book were... In a few years, Rose, it will be your turn! I had the girls all come an hour early to this meeting, so we could spend time finishing their Lap Books. They all turned out lovely, and will make such nice keepsakes from the year! 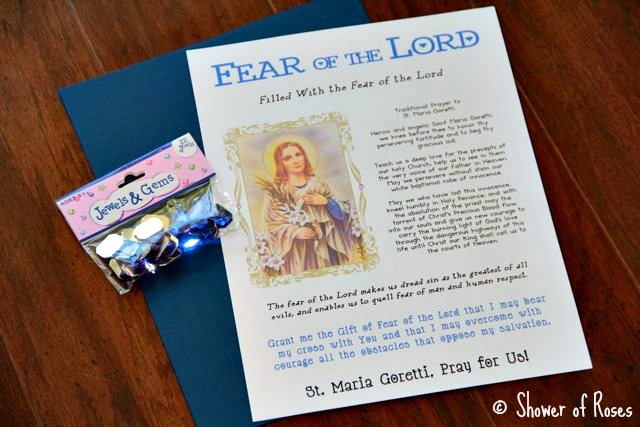 For the notebook pages, I used the motto for Fear of the Lord, a traditional prayer to St. Maria Goretti, an image of St. Maria Goretti, a definition on the gift of Fear of the Lord from My Catholic Faith, along with a short prayer for Fear of the Lord, with an invocation to St. Maria Goretti. You can download my document here. 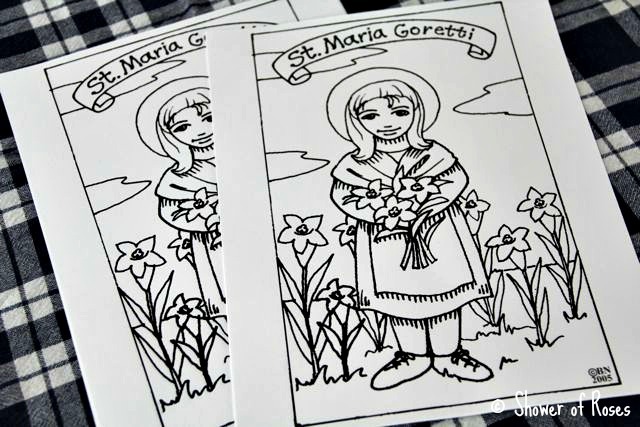 Since this meeting focuses on St. Maria Goretti and the gift of Fear of the Lord, we made Spiritual Bouquet Cards. 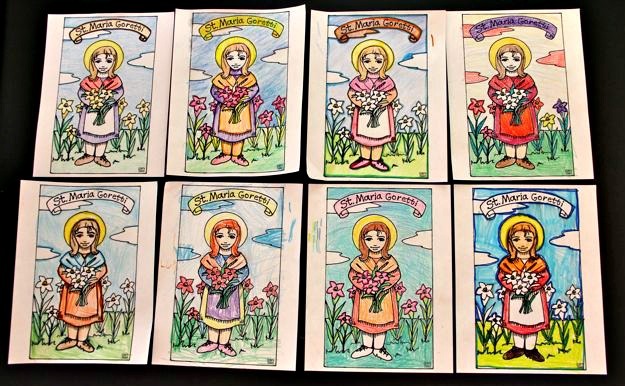 Each of the girls took these home to complete (offer prayers, etc) over the next month, and will give them to each of their Mothers at our Mother/Daughter Tea on September 8th. 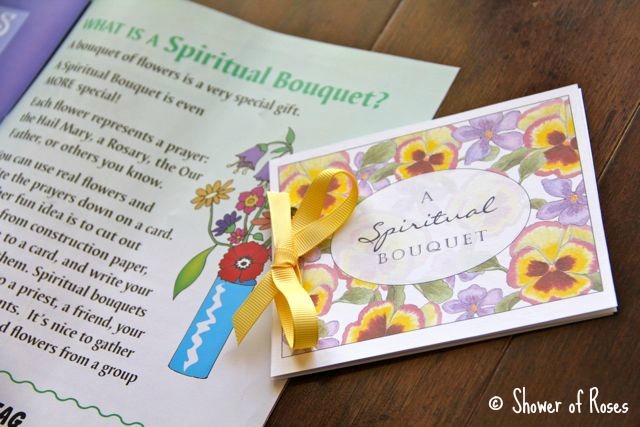 I ended up reading the article on "What is a Spiritual Bouquet?" 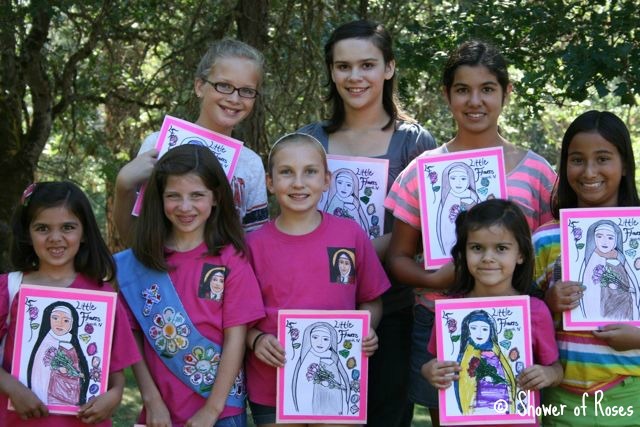 to the girls, from our latest edition of St. Mary's Messenger. What perfect timing! Originally I had planned to make the Flames of Forgiveness Cupcakes that I had come up with last summer for our Saintly Summer Fun with friends. However, when I went to get out the white candy melts for the candy and found that I didn't have any - just every other color, which doesn't really work for white lilies representing purity... Oops! 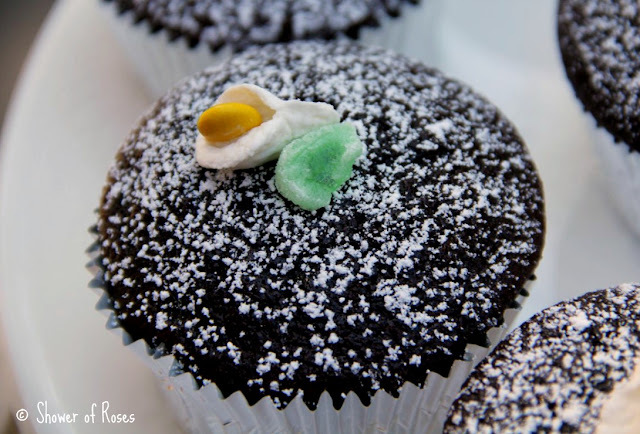 I searched my cupboard to see what else I could decorate cupcakes with for St. Maria Goretti, and came up with a few green gumdrops, a partial bag of mini marshmallows, and a bag of mini M&M's. 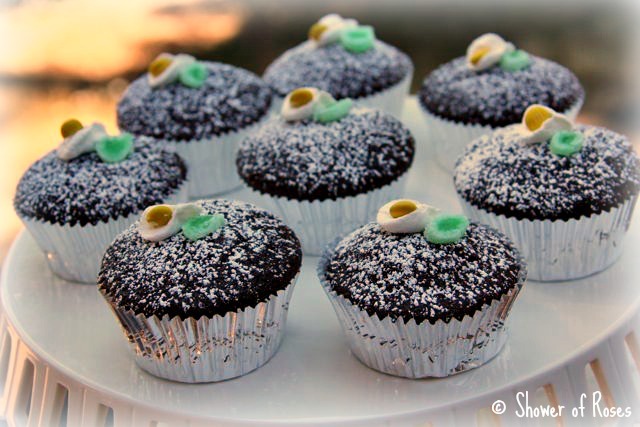 I skipped making frosting (not enough time), sprinkled the cupcakes with powdered sugar, and homemade mini lilies. To make the lilies I flattened a mini marshmallow with a roller, pinched the two sides of one end together, placing a mini yellow M&M inside and a slice of green gumdrop for the stem/leave. 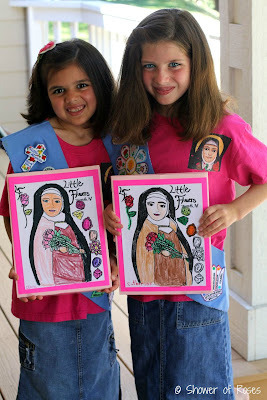 St. Maria Goretti and St. Therese must have been helping me out... I thought they surprisingly turned out really pretty, despite my lack of time and organization! They are very simple, but aren't they cute? Grant me the Gift of Fear of the Lord that I may bear my cross with You and that I may overcome with courage all the obstacles that oppose my salvation. My favorite saint! Amazed by all you do, as usual. Have a lovely weekend! 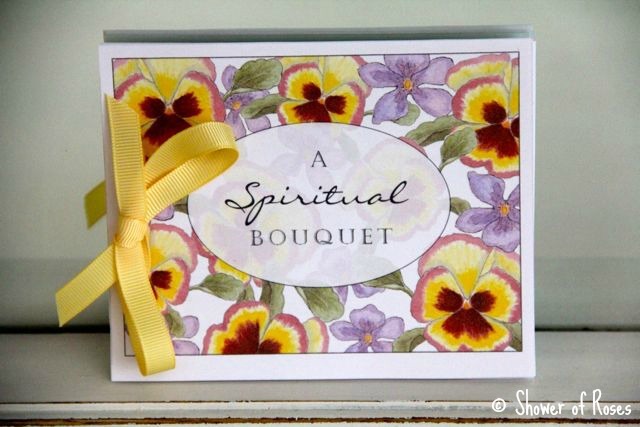 You are such a gift to all the moms doing Little Flowers for years to come! Even when you claim you are not prepared, it all comes out beautifully! You are very gifted at sharing our faith with your Little Flowers! 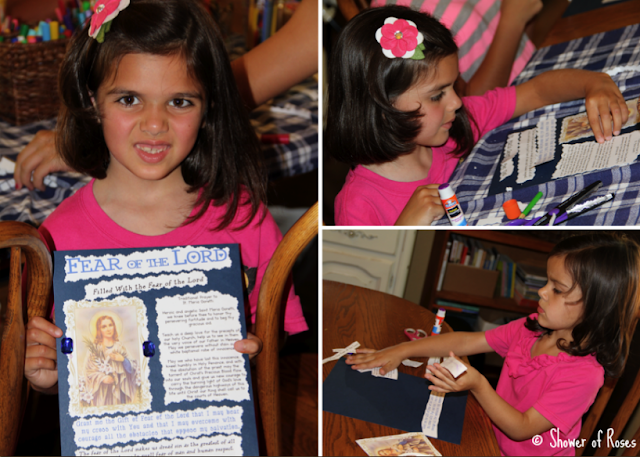 I am excited to have Isabella in the Little Flowers at our church in a few years. Hopefully it is as fun, faithfilled and creative as your group. I am curious as to what kind of printer you have and how much ink you go through. 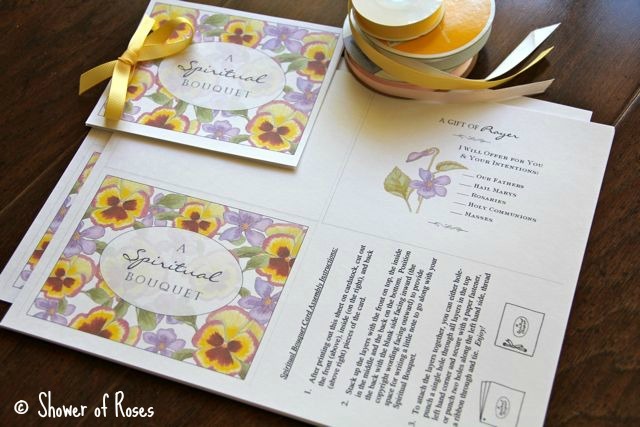 I love all the printouts you have links to but I am afraid of the price of colored ink! They all look lovely, I hope to do something like this with my daughter when she is older. I have a Canon Pixma MP560 that I purchased for about $70 a couple years ago. It has been a great printer! This particular printer has multiple single-color ink cartridges (one for each color and two, both different sizes, of black - one for grayscale and one for color printing. It seems expensive at first, but with my old printer that had a tri-color cartridge, we would always run out of a single color much faster than other colors and waste so much ink. I DO do a LOT of color printing, and way more B&W printing. I'm careful about the settings that I use - opting for "fast" (which used much less ink) or clicking "grayscale" for anything B&W. Still, ink is definitely an expense for us. You got me curious too, so I looked back at my records, and in the last 12 months I have used 2 full boxes of color ink (just opened a 3rd, as we start our new school year) and 1 box of black ink (I just ordered a 2nd box for the new year). I paid $35.57 for the black ink and $74.16 for 2 boxes of color = $109.73 for the whole year. That is exactly the kind of printer we had and I thought it used too much ink but I also wasn't using any of the tricks you just mentioned. (I think I also just have an unrealistic view of how much I will have to spend to make my own copies). I will have to look into it more. I really like colored copies. They are much more pleasing to the eye and make the children feel like it's special, you know? Black and white just gets boring... especially with something as wonderful as the Our Lady of Lourdes Grotto! Your Rose and my Kristen are twins from different parents!Love the face! As always it was wonderful! 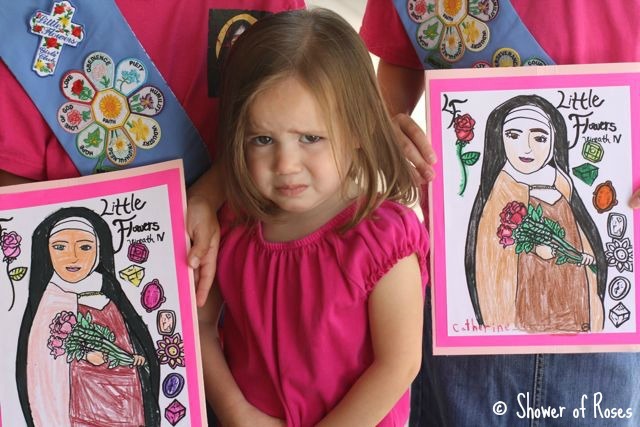 My girls will really miss Little Flowers! That one collage of photos with Ciquita and Buttercup, threw me... they could be sisters, lol. Chiquita, lol. That is what I get for trying to nurse and type at the same time! Let's Travel Back to the World of the Vikings!